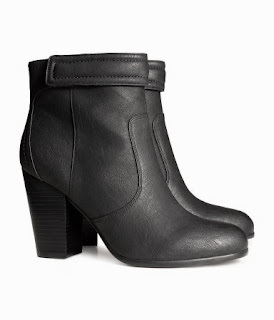 Are you surprised I ordered the red ankle boots in black? I'm not. They're so much easier to combine. I'm still waiting for the red boots to be delivered. So I'm not sure whether they're the right size. But I will find soon I hope. Although H & M combined these orders and I'm especially bummed that they combined with the nice vest because that one might be delivered in January. Yeah that's right. 2014. Yes... And that means the rest of my order won't come either before 2014. But they keep switching the dates. Yesterday the site said beginning of December. But who knows. It won't arrive until it arrives. They were 15 euros in the sale. The original price was 39,95 euros. Including forwarding charges they were 19,90 euros. So excited! Thanks! They look really great, will post tomorrow!